The game used four 16 color hardware sprites for the main player vehicle which were independant of the remaining 16 colors used by the dual playfield setup. 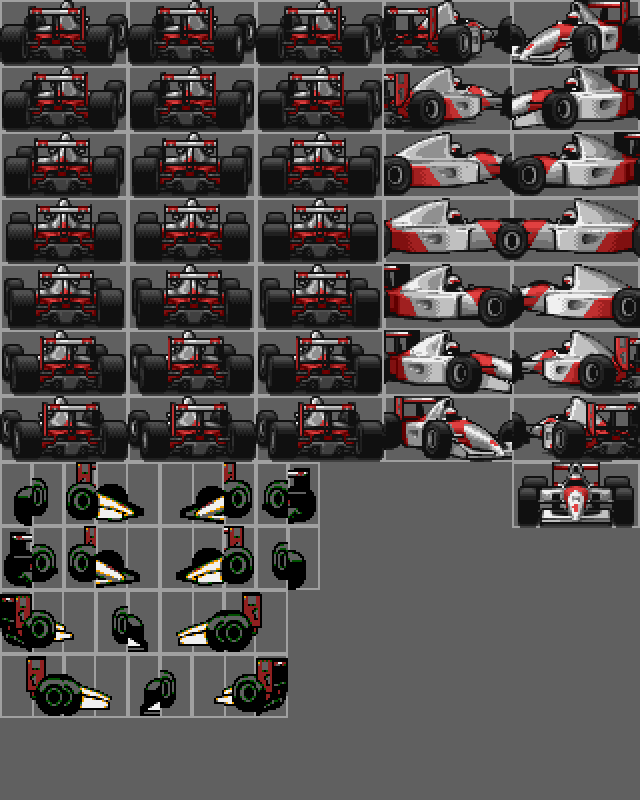 It was therefore possible for the main sprite, which would be much more in the focus of the player, to use much more colors than the backgrounds and rival cars which only had 8 colors each. There are additional 8 color graphics for the front and back pieces of the car when skidding, because the car would otherwise be too wide to fit inside of four 16 pixel wide stripes. These aren't hardware sprites and they have to share the same color palette as the background graphics. The color reduction goes unnoticed because this animation goes by so fast that the human eye cannot detect such small imperfections. The first 16 colors of the palette simulate the sprite palette while the second 16 colors simulate the background and rival car palette. On the real Amiga this would actually be the other way round because the hardware sprites always used colors 16-31.